Germany, 6 oct 2015.- The maker of Mercedes Benz cars and trucks, along with Volvo, lead research to travel without driving. On October 2, Mercedes Benz showed a real test with an autonomous truck, as reported by the portal roadtraffic-technology.com: DaimlerTrucks has tested the first series production Mercedes-Benz Actros truck equipped with the intelligent Highway Pilot system along Autobahn 8 between Denkendorf and Stuttgart, Germany. 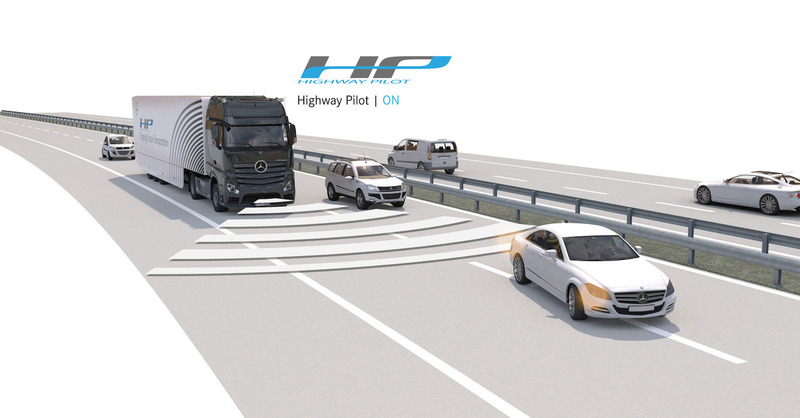 The Highway Pilot system installed in Actros allows semi-autonomous driving, by steering the truck on motorways. However, the driver retains full responsibility and is required to monitor the traffic at all times and intervene at any time. With the Highway Pilot equipped Mercedes-Benz Actros, the company has sent a series-production autonomous truck onto public roads for the first time. “Autonomously driving and networked vehicles improve the flow of traffic and can play a decisive role in helping to avoid traffic jams and relieving the strain on drives.” Baden-Wurttemberg minister-president Winfried Kretschmann said: “Autonomously driving and networked vehicles improve the flow of traffic and can play a decisive role in helping to avoid traffic jams and relieving the strain on drivers. They also boost traffic safety. “In view of this, the state government is currently planning to set up a test field for autonomous and partially autonomous driving, which will be open to any potentially effective technologies. As noted by the portal roadtraffic-technology.com: This project enables the technology and infrastructure required in this connection to be tested and examined on motorways, rural and urban roads. It is also intended to promote the development of the legal framework for autonomous driving.” Featuring front-mounted radar and a stereo camera, as well as well-proven assistance systems such as Adaptive Cruise Control +, the Highway Pilot was adapted for use on public roads, and enables the driver to take over the steering in case of excessive deterioration of weather or the road parkings. The system automatically brings the truck to a safe stop if the driver still fails to react in time to its audible and visual signals, and is said to be always 100% active and never suffers fatigue. With the latest trials, which evaluated smooth interaction between the components, the system has absolved around 20,000km on test routes in Germany and the US. After securing permission from the Baden-Württemberg government, the new truck is currently able to drive semi-autonomously on motorways at speeds of up to 80km/h across Germany. Reblogged this on VÍCTOR VILAS.